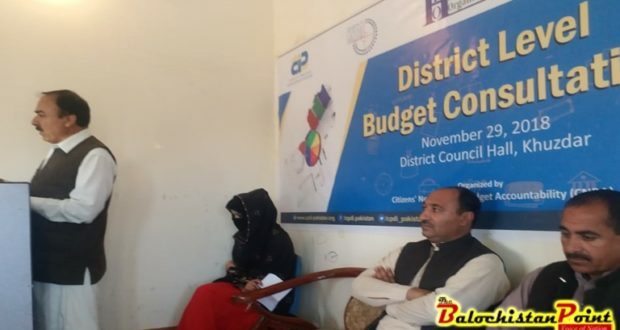 KHUZDAR: Centre for Peace and Development Initiatives (CPDI) has revealed in its study that Budget Call letters delayed, budget time line is not followed properly and none of the 20 surveyed districts have involved the general public and the stakeholders in budget making. According to the ‘Study of Budget Making Process at District Level in Baluchistan, only 4 districts issued pre-budget statements where the copy was not present for the public, none of the districts has a functional website, 19 out of 20 districts stated that there was no separate budget branch. Citizens Network for Budget Accountability (CNBA) member organization, Human Prosperity Organization, focal persons said that the local governments (LGs) had failed to include stakeholders in the budget making process. “Only 4 out of 20 districts released pre-budget statement that would have provided the stakeholders a chance to express their opinion on budget proposals. Pre-budget consultation with stakeholders were held in 80% of districts, mainly involving district officers and elected representatives, ignoring citizens and other important segments of society,” he added. He added that Budget Call Letter (BCL) must be issued in September as first step of district budget making. The study shows that 85% of the surveyed districts did not receive the Budget Call Letter (BCL) from the Provincial Government till holding of this survey in June 2018. It was also revealed that districts were not making use of information technology to share information with citizens; There was not a single district that had functional website. To aggravate the situation further not a single district issued a citizens’ budget.